Around the time I was wrapping up the 365 sketches project, I was already starting to think ahead about new projects. I really enjoyed using my digital drawing pad with the oil pastel setting in Corel Painter 11, and when I saw real oil pastel crayons in a store I bought one black and one white. A cheap way, I figured, to see if I would like drawing with them on actual paper. This afternoon at work I was writing condition reports on some purposefully smudgy drawings by a contemporary artist, and I remembered the oil pastels at home in a drawer. I said to a colleague, “do you think if I went home this evening and made something like this, I could call myself an outsider artist?” She replied, “You have a master’s degree in art history. I don’t think you qualify as an outsider.” So this is legit folks! Real contemporary art! The process I used to make this abstract drawing was spontaneously creative, but drew on themes of sampling and replication in some prints I had to write about today. First I sketched an abstract shape (the base of the lamp I use to light my workspace), and then I pressed the image onto another sheet of paper to make an offset print. I touched up the original sketch with another layer of pastel, and repeated the pressing process 4 more times, juxtaposing the position of the shape and letting them overlap. 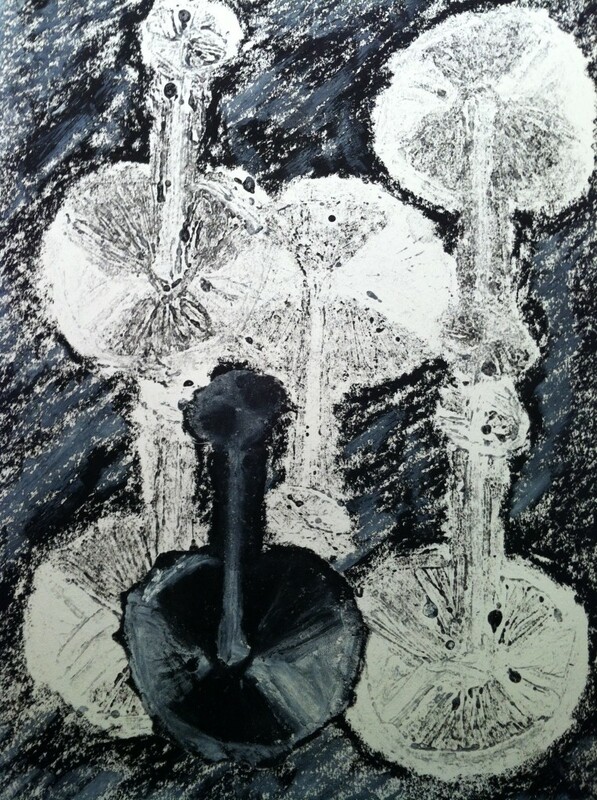 Then I filled in the background around them, making it nice and smudgy. I was just about to call it quits and throw away my original, when I realized I could cut it out – or better yet tear it out – and paste it onto the surface to make the artwork a drawing, with offset drawings, and a collage. And that, my friends, is what you see here. It has seemed a little odd not to be sketching for the last 11 days, and this evening after dinner I thought it would be relaxing to get out the digital drawing pad and do a little painting. So while I won’t be making a picture every day, there’s no reason not to post a few here and there. I spent much of the workday completing condition reports on photographs in the big exhibition “Zoe Strauss: 10 Years” that is opening this weekend. 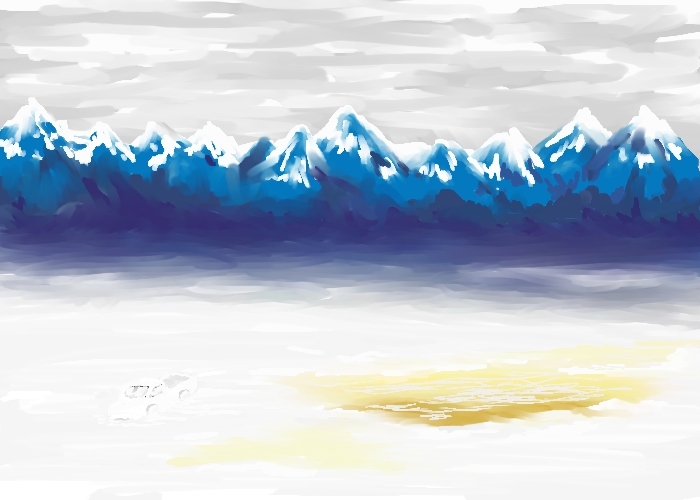 One that caught my eye in particular captured a scene with a snowed-over truck near a lake of yellow ice and blue and purple mountains in the distance. I made this sketch from memory because I liked Zoe’s photo so much. I don’t remember what she called it though, or where the location was! ABOUT THE SLIDESHOW… Each of the 365 sketches displays for about 2.25 seconds in the order in which I made them. For those who want to study an image in particular, hit pause along the way. I have been skeptical about the success of this slideshow request because I prefer to ditch the drawings I like least. I think there’s plenty of garbage in here. Plus even at just over 2 seconds each, the slideshow is almost 15 minutes. I must admit, however, that upon forcing myself to watch it once all the way through, I was surprised to see a progression of subjects and styles that I was not fully conscious of at the time. More than once, I said to myself, “Oh, this sketch came right after that one? Interesting…” Last, I spent too much time trying to find music I thought would work (nothing seemed all-around satisfactory), so there’s no sound. Pretend you’re in a quiet gallery, or if you like, play your favorite tunes while watching. 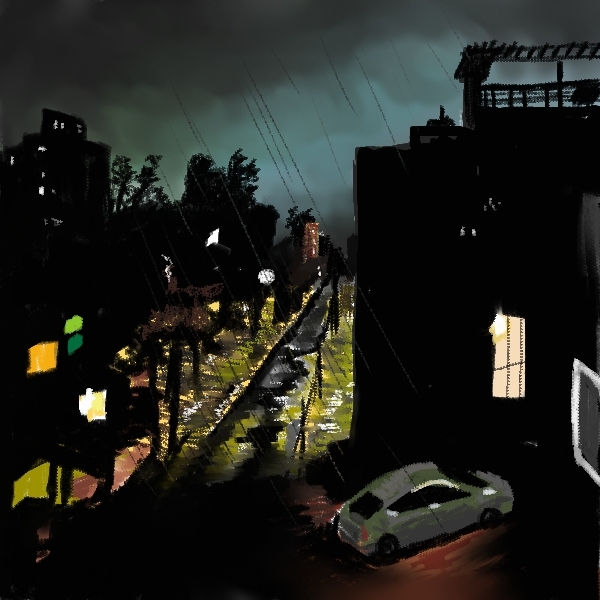 For those who are interested in seeing my “best of the year” slideshow, visit http://mysketches.net/?p=1722 and link to the video, or go directly to http://youtu.be/oAhToX_w1OU on youtube. ABOUT THE SLIDESHOW… Some friends previewed an earlier version, and they seemed to like it. The images move by very fast (there are 221 included in just under 6 minutes), and it was suggested that there should be more time to study each one. I personally like the pace, which, to me, suits the rhythm of the music, and also reiterates the quotidian nature of the project. I also received a request for a slideshow with all 365 drawings, in order, and I will make and post one soon. The sketches for this show have been edited and rearranged to my own liking. I am a curator after all! Interestingly, I guess this arrangement reflects the way that I approach art on a daily basis in my work at the museum: rapidly looking at a large volume of images, culling and sorting along the way, then arranging them to be viewed by others. All that said, chance played a fair role in the making of this slideshow, and I myself have been delighted to discover relationships between sketches that just happened to land next to each other in the end. I hope everyone enjoys this as much as I do! Oh, and I’m just learning about making videos and posting them. So while this might look fine on my computer, if there are audio/video synch issues when you watch it, please let me know! Day three hundred and sixty-five: Whoops! New Year’s Eve dinner with friends went later than expected, so I only had 45 minutes to make this sketch and post it before midnight. 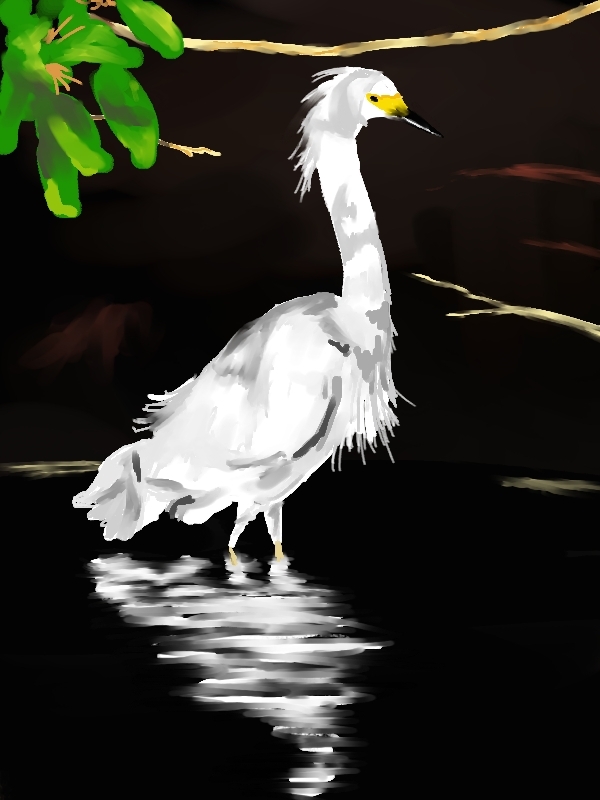 It’s based on a photograph I took in Costa Rica of a white heron (I don’t remember the exact species) that was walking along a shoreline dappled with light and shadow. I’m delighted to find that after 364 sketches, it was easy to paint a quick study of this lovely bird. Cheers! Day three hundred and sixty-four: I have to admit that this evening I just wasn’t feeling it. I flipped through photos, but wasn’t inspired or motivated by any of the subjects. It didn’t help that I got a late start either. 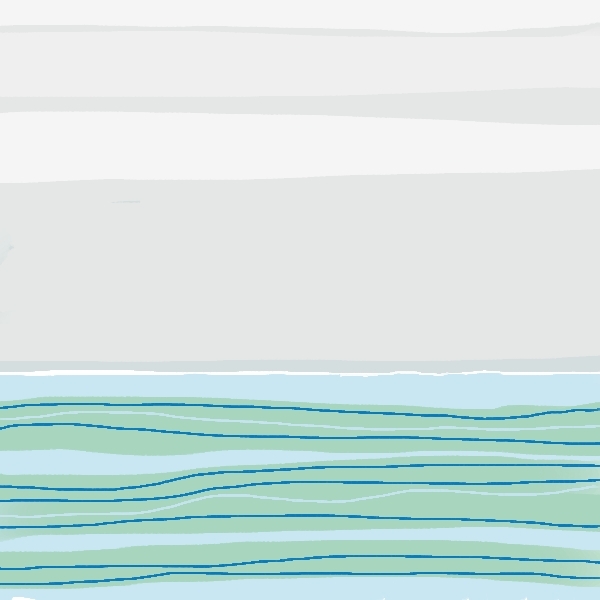 Several dreary pencil doodles later, I flipped to color, and made this simple abstraction of a seascape. If there’s one thing I have learned through this project is that some days are amazing, most are average, and a few are rather dull. I find it’s best not to judge things too much, and often I’m surprised by just how well the sketches turn out. What’s been most important is taking it one day at a time, and making the sketch no matter what. There’s one more sketch to go, and I can honestly say that I have no idea what it will be. I hope it’s a good one! 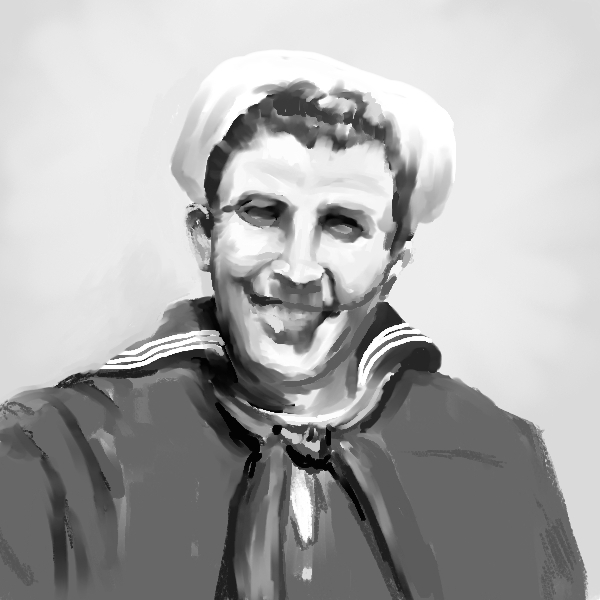 Day three hundred and sixty-three: Although it doesn’t look much like him at all, this sketch is based on a photo of my Grandfather when he was in the Coast Guard around the time of WW2. My brother sent me some old family earlier this week, which reminded me of some others I had scanned a couple of years ago, of which the photograph of my grandfather is one. I’ve looked at it as a possible sketching subject a couple of other times this year, but I’ve always avoided it because I don’t really do portraits very well. Plus the scanned black and white photo is a little fuzzy. Nevertheless, I figured it was worth an attempt, and in the end it was a great way to remember my grandfather and study what he looked like when he was a young man. Day three hundred and sixty-two: Years ago, while riding in the passenger seat during a rainstorm, I snapped a photo out of the front window. I think we were on our way home from a rowing regatta in Omaha or Topeka. 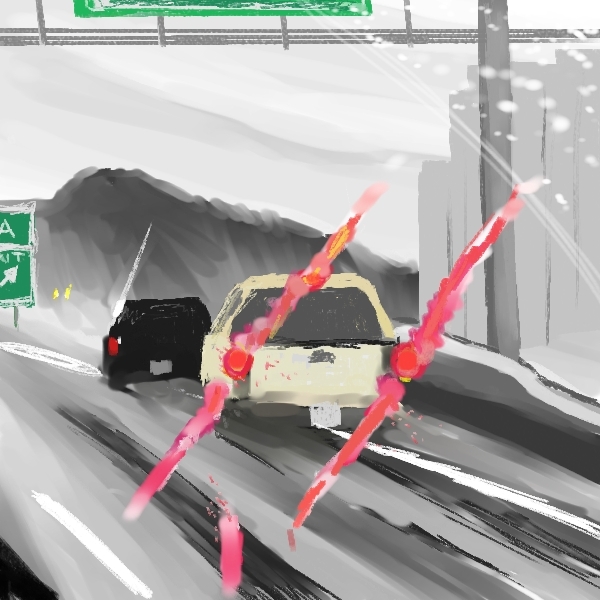 Tonight’s sketch is based on a detail from that old photograph, and I let the sloppiness of my lines and brush strokes help to simulate the diffusion of form and color caused by spray on the road and the windshield. 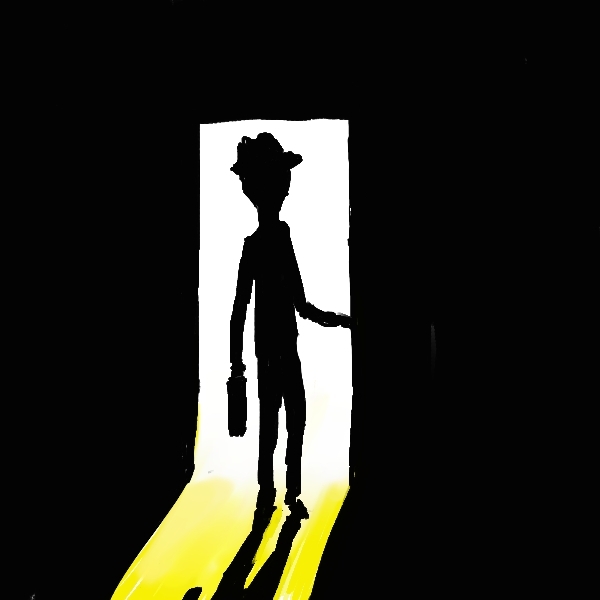 Day three hundred and sixty-one: Life is not nearly as simple as this little sketch of a man in a doorway. Nor is it all black and white. It’s funny how adding just a little yellow to the floor makes such a difference! What I’m still not sure about myself, is whether he is coming in or going out… BTW, this is the first of the final five. Just as every other day of the year, I have no particular plan, and I’m looking forward to seeing how the year of sketches wraps up! Day three hundred and sixty: I invented this cityscape so I could paint a waxing moon and a lone star like those I observed out of my apartment window around 6:00 PM this evening. 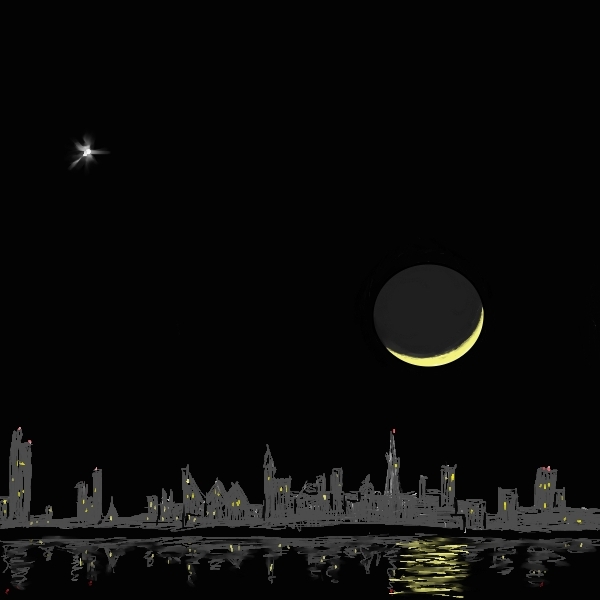 When I noticed the moon hanging low in the sky, I realized that the one I painted on Christmas Eve was entirely wrong! The part of the moon in darkness is still lighter than the night sky, not darker. And the sliver lit by the sun should appear to the bottom and right within the circle, not to the right side. 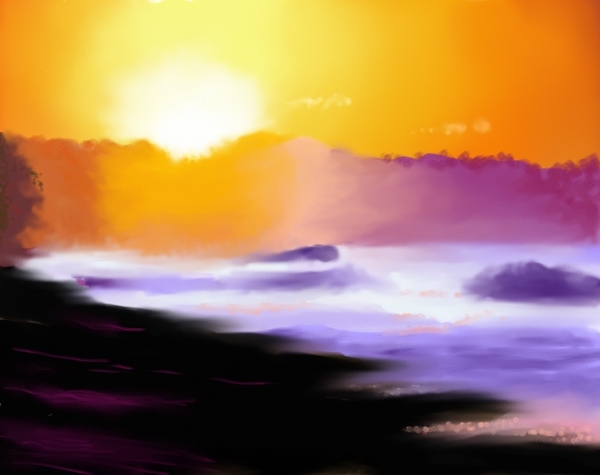 Of course painting this type of moon and one star only took about two minutes, so I had to add some sort of scene to go along, even if it was something simple.